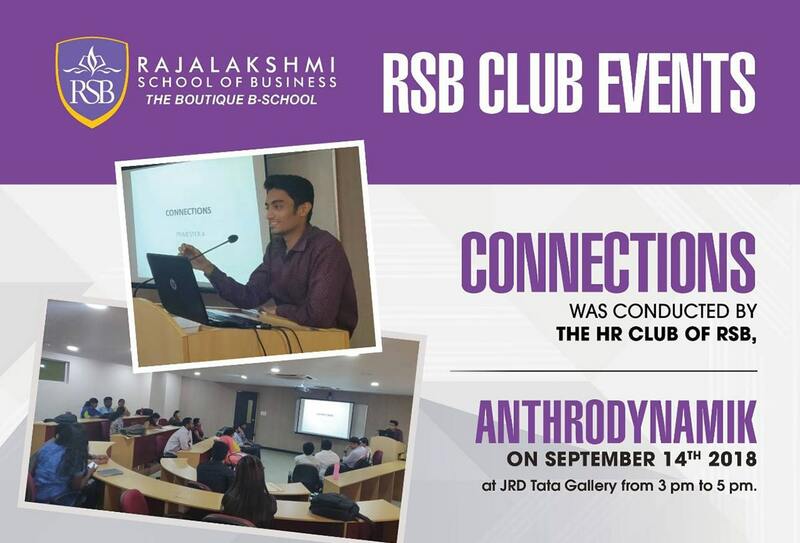 ‘CONNECTIONS’ was conducted by the HR club of RSB, ‘Anthrodynamik’ on September 14th 2018 at JRD Tata Gallery from 3 pm to 5 pm. Six teams participated with two members in a team. The contest was that the participants had to connect the images and answer the questions asked. The game consisted of three rounds; the first round was movies where the teams had to find the name of the movie with the help of the pictures displayed with respect to the movie. In this round two teams with the least score got eliminated and the remaining four teams were qualified for the second round. The second round was the brand ambassadors round. Here the participants had to guess the name of the product from the pictures of their brand ambassadors. In this case two teams with least scores got eliminated and the remaining two teams entered into the final round. The final round was a puzzle round. Brijesh Kamath and Jayant Paul were declared as the winners and were given certificates and prizes.